Performing a load or position controlled fatigue test requires a servocontrolled test machine. Fatigue testing machines historically have been servohydraulic or servocontrol of a hydraulic actuator. TestResources has innovated a series of servo-all-electric test machines (see 800L Series) that provide closed loop control of an actuator that only requires electric power. These machines have served the needs for tabletop machines that are capable of performing both static and dynamic testing of materials and products at force ratings below 22000 lb. Servohydraulic actuators are higher cost but remain best fits for applications where high loads are combined with the need for high speeds, or high frequencies. Our servohydraulic testing machines (See 900LX Series) are supplied with our modular servocontroller. Our modular test system enables both types of actuators. Although they have become standardized, a fatigue test machine, as a rule of thumb costs twice as much as a static machine, since it can perform both types of tests. 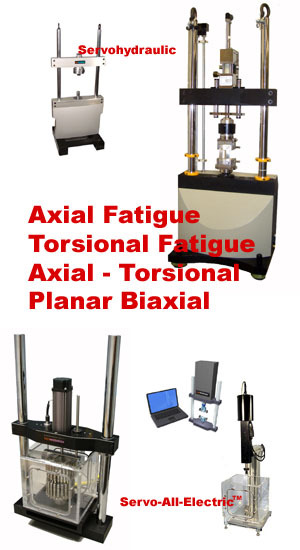 If your material, product or device experiences cyclic loading in tension and compression, or repeated loading, then you may need a fatigue tester, because the behavior of your product will differ from a static loaded condition. Test parameters to configure a test system include load, test frequency, sample stiffness, test method type, sample geometry, and strain amplitude. Although they have become standardized, fatigue test fatigue tester fatigue test machine fatigue test equipment fatigue testing fatigue tests fatigue testing machine test of fatigue torsional fatigue test amsler fatigue dynamic seam fatigue tester fatigue test system high cycle fatigue testers mts fatigue resonant fatigue tester torsion fatigue test bending torsion fatigue testing machine dental implant fatigue test dynamic seam fatigue fatigue life of spine fatigue test actuators fatigue test catheter fatigue test machines fatigue test of metal fatigue test of rebar fatigue testing in metals fatigue testing of metals fatigue tinus olsen hydraulic wedge grips for fatigue testing metal fatigue testing multiaxial fatigue test equipment needle fatigue test rotational fatigue testing machine table top wire fatigue machine tests de fatigue textile fatigue textile dynamic testing fatigue pdf torsion fatigue torsion fatigue bench used fatigue testing equipment wire fatigue test bending-torsion fatigue fatigue test fatigue test plastic fatigue test polymers fatigue test rubber fatigue testing apparatus fatigue testing grip design fatigue standards medical device fatigue torsion test metals fatigue test pdf seam fatigue test grip 3 point bend fatigue 3 point bending fatigue 4 point beam fatigue test 4140 bending fatigue data a fatigue testing machine actuator vibration electro hydraulic fatigue test adrenal fatigue saliva test aluminum fatigue test sample aluminum foam fatigue testing machine amsler fatigue test machine analysis of fatigue testing machine application fatigue test astm fatigue specimen tensil test astm fatigue astm dimensions for fatigue test of steel astm fatigue standards astm fatigue test for exercising machine astm fatigue test specimen astm fatigue testing specimens astm methods low cycle fatigue test pdf aluminum astm standerd for fatigue testing e606 astm static fatigue test of composite material axial compression fatigue machine stent axial fatigue machine axial fatigue test machine baseball bat fatigue beam fatigue rig bench fatigue test methods bench testing fatigue analysis bend fatigue test rig flexible pipe bend fatigue tester bend fatigue testing bending fatigue test machine capacity bending fatigue test machine pdf bolt fatigue a fatigue test machine, as a rule of thumb costs twice as much as a static machine, since it can perform both types of tests. If your material, product or device experiences cyclic loading in tension and compression, or repeated loading, then you may need a fatigue tester, because the behavior of your product will differ from a static loaded condition. Test parameters to configure a test system include load, test frequency, sample stiffness, test method type, sample geometry, and strain amplitude.